School of Computer Applications and School of Computer Engineering, KIIT Deemed to be University organize the 3rd International Conference on Smart Computing & Informatics (SCI) on 21st and 22nd of December, 2018. School of Humanities was also a part of the team with a special session on ‘ICT in Social Sciences and Management (ICTSSM)’. 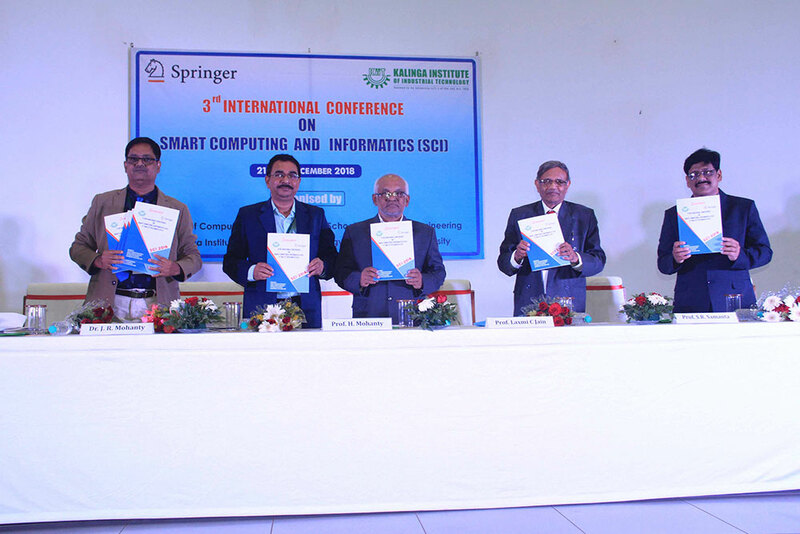 The aim of this 3rd International Conference on Smart Computing & Informatics was to present a unified platform for advanced and multi-disciplinary research towards design of smart computing and informatics. The proceedings will be published in the Springer Nature – SIST series and submitted to DBLP, SCOPUS, ISI Proceedings, EI-Compendex, Google Scholar and Springer link for indexing. Delegates from all over India and abroad attended the conference. Professor Lakhmi C. Jain (University of Canberra and University of Technology Sydney, Australia); Professor Yen-Wei Chen (College of Information Science and Engineering, Ritsumeikan University, Japan); Professor Milan Simic (School of Engineering, RMIT University, Melbourne, Australia), Professor Sheryl Brahman (Missouri State University, USA); Professor Mika Sato-Ilic (University of Tsukuba, Japan); Professor Peter Ilic (Center for Language Research at the University of Aizu, Japan) and Mr. A. Bose (Senior Publishing Editor, Springer Nature, India) were the key note speakers of the conference. The conference was inaugurated by Prof. Hrushikesha Mohanty, Vice Chancellor, KIIT DU. The Welcome Address was delivered by Prof. Samaresh Mishra, Dean, School of Computer Engineering followed by the address of Prof. Suresh C. Satapathy, General Chair, SCI 2018, on the concept of SCI 2018. The meeting ended with the vote of thanks by Prof. J. R. Mohanty, Professor, School of Computer Applications.